“I make different decisions now,” says Giovanna, 13 years after being diagnosed with neuroendocrine cancer. Her world crumbled after her diagnosis until she realized how she could use her music to heal — both herself and others. In honor of #RareDiseaseDay 2019, February 28, here is the final episode in CCF’s 50th Anniversary Video Series. This series has been made possible by the generous support of Lexicon Pharmaceuticals as part of the Fit-to-Fight series. 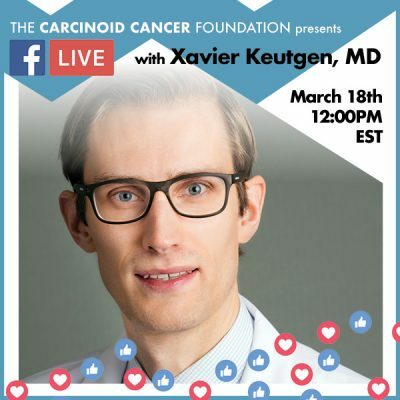 Watch the complete series here, https://www.carcinoid.org/for-patients/videos/ccf-50th-anniversary-videos/. 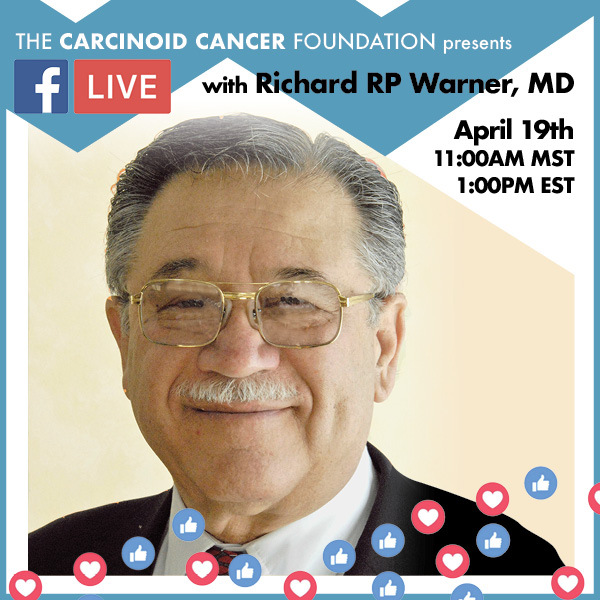 Join us on our Facebook page on Friday, April 19 at 1 pm EST for a special FACEBOOK LIVE event with NET specialist Dr. Richard Warner on Carcinoid Syndrome and Serotonin. Hope to see you there! 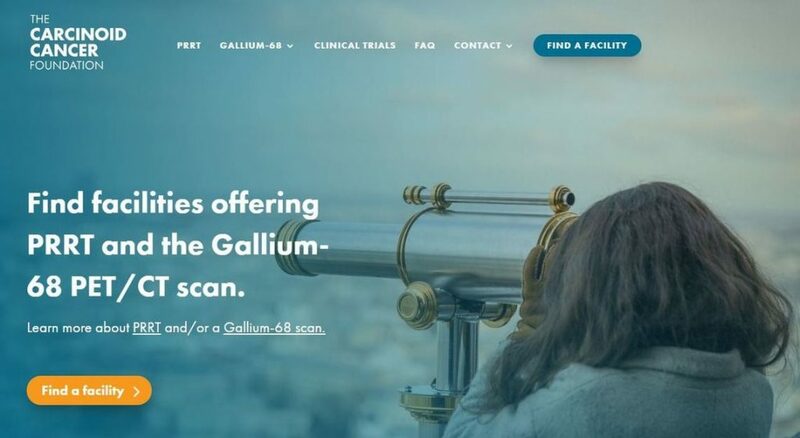 CCF is excited to announce that we have launched a new website dedicated to providing information about PRRT and the Gallium-68 PET/CT scan. This site also includes an interactive map to locate facilities where PRRT and/or the Gallium-68 PET/CT scan are being offered. The map will be updated regularly as additional facilities provide these services. Visit CCF’s new website at https://www.prrtgalliumcenters.org/. 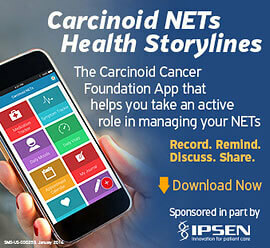 Below is a short clip from the program featuring NET expert David Metz, MD talking about the signs and symptoms of carcinoid syndrome. 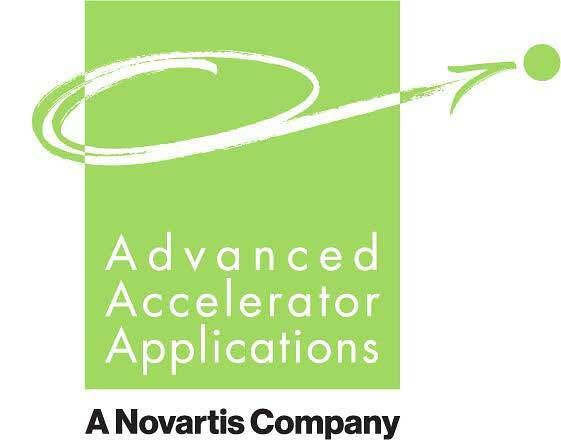 The US Food and Drug Administration’s June 1, 2016 approval of the Gallium-68 PET/CT DOTATATE scan using NETSPOT® heralded a new age of nuclear imaging in the United States for neuroendocrine tumors. Click here for more information about the scan and locations of where it is being offered throughout the US. We will be adding to the list based on feedback from the NET community. Have you or someone you love been diagnosed with a neuroendocrine tumor or carcinoid cancer? It can feel like a daunting task to figure out next steps and doctor appointments may be overwhelming. You can help yourself or support a loved-one by learning about the disease and preparing yourself for doctor visits. The first visit may be the most challenging, so It’s important to arm yourself with relevant questions. Here we provide you with six questions, specific to neuroendocrine tumors, to ask your doctor. Click here to download the infographic. The Carcinoid Cancer Foundation has launched a website, www.carcinoidsyndrome.org that is a space for everything about carcinoid syndrome – from diagnosis and treatment to news and community updates. This site is a great resource for patients, caregivers, and physicians alike – looking to learn more about carcinoid syndrome. Please visit often and let us know your thoughts as we plan to regularly update the site. Welcome to carcinoidsyndrome.org! Know the signs and symptoms — skin flushing, diarrhea, heart racing . . . it could be carcinoid syndrome! How is it diagnosed, what are the treatment options, what questions should you ask your healthcare provider? 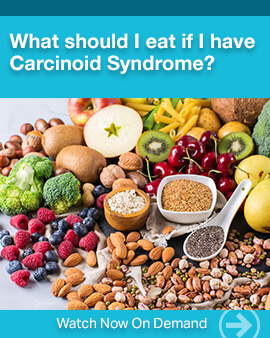 Read more in this new publication, Guide to Understanding Carcinoid Syndrome, from Health Monitor and the Carcinoid Cancer Foundation: https://www.carcinoid.org/wp-content/uploads/2015/10/Carcinoid-Syndrome-Guide-to-Understanding.pdf. To combat statistics showing that it often takes 5 to 7 years for patients to receive the correct diagnosis of a neuroendocrine tumor (NET), the Carcinoid Cancer Foundation has partnered with Advanced Accelerator Applications to create an infographic listing common symptoms and misdiagnoses. Please share this broadly in hopes of helping others get the proper diagnosis more quickly. Download the infographic here.